Our easy to use interview scheduling software allows you to quickly schedule your interviews online with customized invitations and confirmations. As an online interview scheduler created for recruiters, Interviewer Assistant allows you to quickly and easily create new interviews. 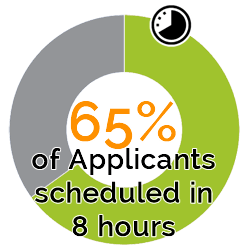 With our online interview scheduler candidates will receive invitations and confirmations immediately, resulting in faster bookings and less work for you. Watch how Interviewer Assistant helps with your interview scheduling. 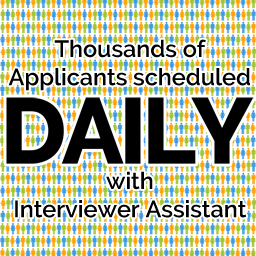 Start scheduling interviews now with a 30 day free trial. An online interview scheduling solution. Designed specifically for interview scheduling, it’s a fast and effective way to schedule interviews. 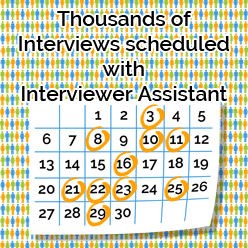 You won’t need to install anything as Interviewer Assistant is a 100% online interview scheduler. Interviewer Assistant’s pricing is transparent and easy to understand. 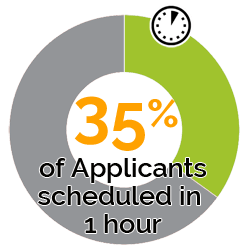 You will never be asked to schedule a demo or speak to a sales rep. We know you are too busy scheduling interviews for that! Not only customized but fully branded with your organization's logo so your candidate's will always know they are scheduling an interview with you. Interviewer Assistant BlogWe thought of a few things for you to read.